Home >> Helper Hair >> Reviews >> Oh Hello, Lace Front Topper! I feel like I’ve tried so many toppers over the past several years, but unbelievably, I had never tried a lace front topper. I’ve tried lace front wigs, sure. But never a lace front topper, and never a human hair one, to boot. Uniwigs.com sent me their best-selling Claire topper to try, and I was really looking forward to seeing what this lace front thing was all about. Claire comes in two base sizes, either 5×5 or 6×6. Since my hair loss is on the more advanced side, I opted for the 6×6 base. 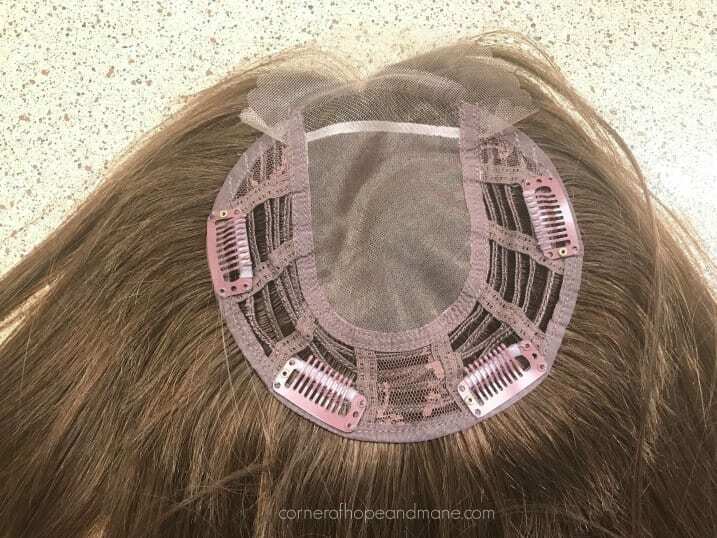 The standard length on the Claire topper from Uniwigs is 16″, but the customer service team at Uniwigs is able to add additional length if you need it. I found 20″ to be perfect, as it’s the same length as my bio hair. You guys! I have a part again! Oh, can’t listen to audio right now? Be sure to check the CC option! I so wish the color was 100% perfect right out of the box, but that’s next to impossible with human hair. To make it more ME, I’d definitely need to add some dimension. But, how about the part, though?! Here’s a photo of the base. It comes with four pressure-sensitive clips. See the meshy part in the middle? That’s what’s considered the mono, or monofilament top. Basically, it’s a lace-type area that allow you to part your hair on whatever side you like. If you prefer a silk top, that’s also available (I just have no experience with that particular piece). I know some women just feel better with a silk top versus a mono top, but I’ve never found anyone notices the difference except for ourselves. Besides, if someone is THATCLOSE to the top of your head, you need to tell them to “get off my grill”, ‘naw mean? Around the mono area is wefting, and the hair in the section is attached differently than the hair in the mono area. You can definitely pluck the part to your liking, and can do so a bit haphazardly to get a part that’s less precise. I have to say, I absolutely LOVE having a “real” part again with a lace front topper. The lace also looks really good close up – I hope you were able to see it in the video. But you can see that even against my fingers, it blends pretty well. I did have one concern when I first received this Claire lace front topper: I was nervous that the lace wouldn’t lay flat on a topper. With lace front wigs, you have tension that pulls all around your head, which helps to keep the lace flush with your skin. Obviously, you can’t have that same tension with a topper, so I was worried the lace would kind of just hang there. I was surprised that it laid pretty well, as you can see in the video. One thing to note about the lace that I failed to mention in the video: I did cut back the lace. The lace comes super-long (evident in the photo, right?) so that you can cut it back to your desired length. I cut it to just under 1/4″ with a regular part of craft scissors. The lace cut easily and didn’t fray. I do think the lace feels sturdy (yay! ), but not starchy-stiff like some lace fronts do (boo! )…so that’s a plus! So, who is this Claire topper perfect for? If you’re looking for affordable, the price can’t be beat at $285. Remember to take 10% off with code LAUREN10. Also, if you MUST have a part that meets your forehead, or you don’t have enough hair to incorporate into a standard-front topper, then you should explore a lace front topper. Like any topper, it takes some fiddling with to get it the way you want it (and with human hair comes the additional consideration of adding color to truly make it yours). But, oh, to have that gap in the hairline back is amazing! Check out Claire here or see the full topper collection at Uniwigs.com. If you’re interested in a synthetic piece, check out my Point Synthetic Mono Hair Topper Review (from Uniwigs)! What can I answer about this piece? Leave me a comment with thoughts or questions! It is SO fabulous having you provide such detailed information as you do. Thank you so much for the assistance and support you provide to us! What are you thoughts on using a lace-front topper like this with bangs? Would the lace front have to sit at my hairline, or do you think I could sit it back a bit further, have bangs trimmed in to the piece and blend in some of my natural bangs? Really, I’d appreciate any tips for blending hairpieces with my bangs… I’m having a really hard time getting them to look natural. Hi Jody! I think you could position it back a bit further. The big benefit of a lace front then, with bangs, is that you’ll get some natural looking lift (you wouldn’t typically have this with a non-lace front). Also, if you’ll be wearing bangs, I’d cut the lace back even further than I did. Just go slow and trim little by little. Love this video Lauren! Thank you for your review! Do you have any how-to videos on blending your topper in like you mentioned you do on a daily basis? The thing with human hair is that it is sourced from multiple women and then typically processed…so if you deposit color the look will be uniform, since you are adding color. If you try to strip by going lighter, you have no idea how each individual hair strand is going to take. That’s why it’s always recommend in NOT lighten, unless you are dealing with virgin hair. I hope that makes sense! It seems so weird, but you are better off going way blond and then making it the color you want with darker dyes. Also, which one are you looking at that has Natural Black? I’ve seen it but now can’t find it. Pure black hair is much more easily sourced in the hair world…but it still makes me nervous that it would lighten appropriately. I ordered this and it came yesterday. I was thinking it wouldn’t work because of the small area for parting. I see yours iso far to the side though. So rather than clipping in the topper more centered on your head, do you just have it over to the side more? I really want this to work but am afraid it won’t. What’s the trick? Thank you! Such great timing on this one for me. Katie, 18″ would be $250 and 20″ would be $295 (pre-discount). Hope that helps! Looks fabulous and a great deal too! My last topper looked like it ‘puffed’ up to high on top of my head. I had my head measured and everything. Do you know what causes this? Just head shape or cap shape/size? What size was it? It could be due to incorrect base sizing (too large maybe, for your head shape? )…or could be the piece itself. My Top Wave by Jon Renau, for example, is a bit puffy but it’s just the way it is – I think it has more permatease than usual. Hi Lauren, thanks for this! Do you know if they make the same or similar lace front topper with a larger base? If so, what size? They don’t – I’m not sure if there are plans to introduce a larger size. My loss is pretty dang bad, though…and I really can get by with a 6×6. It’s all preference, as you know! I am wondering would this be a good starter piece? My hair is very thin as I have been through a lot of stress going through a divorce that wasn’t my choice. I don’t want anything too thick as that would be really noticeable on me. I just want to add some thickness so you don’t see my scalp. Please let me know. Also if your hair is short can you go longer or will that be noticable? Hi Christine, maybe. 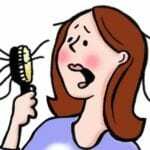 Human hair requires more “messing with” than synthetic and some newbies love it, and others get anxious. Do you have a stylist who might be able to cut-in and thin it for you, if needed? There is a decent amount of hair on this piece, but it’s not overwhelming. Of course, this will depend on your level of loss. The price really can’t be beat if you are willing to fiddle with it! I just want something to give me some hair as not to show my scalp, but I don’t want an over abundance of huge thick hair or that won’t look natural on me… what would you recommend or anyone else? There is also another option called Kathy that will be even lower density. One of these pieces with a smaller base, combined with possibly plucking the part (assuming it’s on the dense side) may work well for you! Thanks, Em! And it’s super-cheap which mean more sopapilla/DQ money! Lauren this is your greatest post to date. Love it! You should put out your own line of toppers, you’re so incredibly knowledgeable. Thanks for sharing. ? Let us know if it serves as a good dupe! Looks great! Esthetic also makes a lace front topper that I love!! Which one is that? I’ve tried the 413 (going from memory!) but that one was a standard rim. Lauren, you look amazing with this topper — so, so natural. I so get what you mean about the part that meets at your forehead… I’ve had “part envy” for awhile now. Also, I’ve had trouble plucking at a part – seems like the hairs on my topper are really hard to get out with a tweezer. Do you find that too, or is it just my piece? This is a mono top – it would be a bit harder with a silk top, I’m sure (I think that’s what you have, right?). Excellent Post! So informative . (I am new at this). This makes sense to cut back the lace. What do you mean “the lace is just hanging out”? 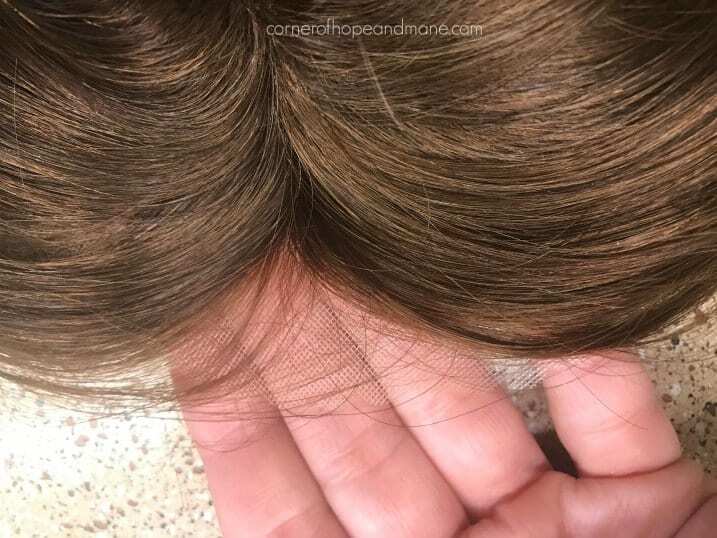 Do people normally glue the lace to thier forehead? I need a topper I can wear only when I leave the house and take off before bed. Will this work without glue? Should I sew a clip to the front? Also, will this cover the Huge bald spot on the Back of my Head? I may be more bald at the back than in the front (like men who start loosing thier hair from the top/back). I may get this, since they have a wavy version. If I can use w/o glue. Hi everyone. I’ve finally decided it’s time for a real topper (I’ve been using little half hh toppers from Wig Pro) I’ve ordered the Clair after watching your review Lauren, in the med. brown also. I know I need colors on the cool side, can any one tell me how to add lowlights or direct me to a video, I can’t seem to find any. I guess I could dye it an ash brown but not sure if that’s a good thing to do? You might consider going to Sally Beauty Supply and asking them – you’d likely need a darker, ash color as well as a toner. I’m not color pro, though…and would be a bit nervous to do it myself. Looking great as always Lauren! Do you think you could attach lace to a regular topper for the same effect? Natasha, no. 🙁 The lace front doesn’t really have a hard “stop” if that makes sense, so the hair moves up the lace and gradually gets thicker. You wouldn’t be able to do that, I don’t think…at least not as a DIYer. Some companies DO add lace fronts to stock pieces that don’t have them (human hair), but not sure how they do it. Hi Lauren, what is this hair like after multiple washes and the silicone has worn off? How long before it becomes frizzy and hard to manage? For the price it’s hard to believe its quality hair… thanks!! Jen, I’ve only washed once. I always follow up with my Silicon Bambu product which I highly recommend for human or synthetic. I wrote about it in this post and call it my “tub o’ miracles”. I’ve been thinking about purchasing this lace front topper next – but am super nervous about the front. Will I be able to wear it as an everyday topper as is, or will I have to glue down the front? Thanks for your help! Misti, it depends. I technically don’t have to, but probably wouldn’t just for peace of mind. Are you nervous about gluing/taping? Hi Lauren: I purchased this piece and love it! Thanks for the detailed review, you described it perfectly! Only problem is I can not seem to get it to stay glued down with Got2B… I’ve been applying the glue to the hard edge of lace and then blow drying,,, but it comes right up. Any suggestions? Hi Janny, a few things. I’d probably try applying it to your forehead, versus the piece. The heat of your head will help. Plus, make sure you are letting it “set” for a few minutes, for some reason that seems to help with the grip. If that doesn’t work…you might try a product called It Stays – it’s a body adhesive. It’s pretty cheap, and it rolls on kind of like an antiperspirant would. And it’s clear. Thanks so much for the tips, Lauren! You are always so helpful! I will give it a try! Hi Dony, look for products that are sulfate-free and moisturizing. For washing, always wash in the direction of the cuticle and be very careful. Longevity will depend on how and how hard you wear it. Some last 6-8 months, some for years. At this price point, I’d expect 8-12 months. Thank you for a helpful review. Looks very pretty. Unfortunately, I see that they increased the price considerably to $285 :-(. Would you happen to know of any similar, “reasonably” priced human hair topper with a lace front that would also have European hair? Looks like they did – I’ve updated the post, thanks! No, I still don’t know of anything less expensive than this with this base size. I try to break costs down when I’m weighing cost vs. benefit…it went up $60 so assuming this lasts 6 months that’s $10/month more. If you’re looking for *European* hair at this price point especially, I’m not sure what you’d find. Lauren, how does this piece compare in density to your other toppers, past and current? I tried your favorite, Top Secret, and wow that was a lot of hair. Way too much for me. I realize that the Top Secret is a bigger base and that is part of it. I love that this Uniwigs piece has a part that looks like scalp. That is what I want. Does the part go all the way back or is it just in that smaller front area? It’s lighter-density, for sure. Top Secret is going to be too much hair for 80% of people, particular if just starting out. 🙂 I’d say the “part” area goes back about 5 inches or so. Lauren, thank you for your helpful video. This piece looks great on you as always. Love how you plucked the hairline into a triangle. That’s brilliant! I’m looking for a dark brown human hair topper for my wedding but I don’t need a lot of length. I also don’t want it to be too thick. I’m considering buying the Enchantop Medium by Gorgeous Strandz. Have you tried this topper? Also, I’ve read that over time brunette toppers can get lighter from sun exposure and shampooing any suggestions on how to combat that? I haven’t tried that topper. I do want to note that I had reader recently who had an experience with them you may want to hear about if you’re going to proceed. Feel free to email me and I’ll see if she’s open to being put in touch with you: lauren at cornerofhopeandmane.com. As for the sun, yes, it can oxidize brunette a bit! You could always try a color-depositing shampoo to help – but it will likely need to be recolored every now and again. 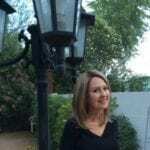 Hey Lauren…..just found you on cornerofhopeandmane.com I am experiencing hair loss due to menopause….BOO ? My question is can I cut bangs into this topper? I don’t want heavy bangs but like a little coverage of my forehead. Can you swim in this? Or any topper? Swimming can be tricky – check out this post about swimming in toppers and wigs…it may help! I want to dye this dark purple and I was thinking I would buy the Almond Frost to dye it. Do you think it wold take color well? Also, do you think this style would work with me cutting bangs into it? I have androgenic alopecia so I bought the 5*5 version, first topper ever and wow is it an amazing feeling to have some hair on the top of my head again! Questions: I really love having a side part but the lace underneath isn’t really very wide to part it, also the hair won’t part for me… It just keeps going back to the part it came as. Any tricks to changing the part on this? Also any advice about the clips, I can feel them pulling sometimes and they can make my scalp sore.